The mining industry is another core sector for Arctic development and it accounts for a considerable share of the northern economy. 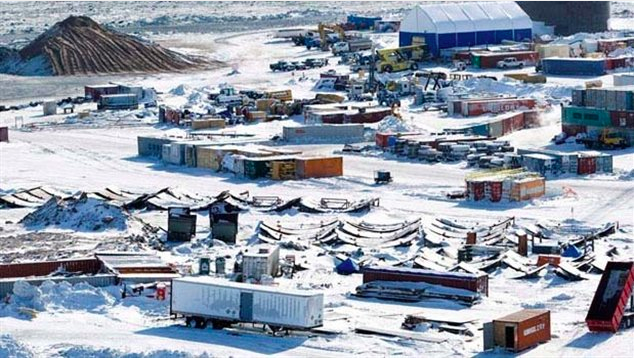 Meadowbank gold mine, Nunavut, Canada. In Northern Scandinavia: In the late 20th century, investments concentrated on extraction of coal deposits from the Svalbard Archipelago. Today, the Sveagruva mine is the largest mine in Svalbard. Mining is also underway and predicted to expand in Sweden and Finland, in Kirkened (northern Norway) and Kiruna. In Greenland mining was for a long time the only export activity together with fishing, and it is now attracting growing investment, similar to that of the oil and gas sector. The opening up of coastal areas as a consequence of climate change is expected to play a key role in the sector’s development. 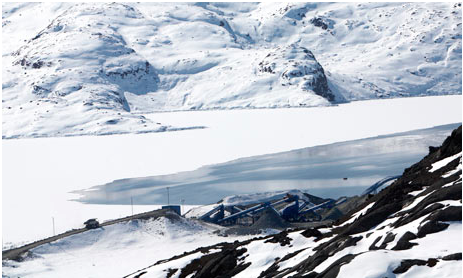 The Kvanefjeld mine, in addition, contains rare mineral deposits that are widely used in high-tech production. The Isua Iron Mine is another large mine currently under development. Other projects include gold, platinum and rare materials production. In Alaska, exports of zinc, lead, gold, and copper account for 36.8% of foreign export earnings at a volume of $1.3 bn. The Red Dog mine produces zinc. Gold mining is also very developed, the largest mine being Knox Gold. In Canada, mining accounts for half of the income in the Northwest Territories (NWT). The Diavik Diamond Mine in NWT required $4bn total spending between 2003 and 2008. Other mines are planned for development on Baffin Island, Nunavut. As of 2012, there are 25 operative mines in the Russian Arctic, including Norilsk Nickel, the largest producer of nickel in the world. This mine is set to increase its output in the future. There is no international binding agreement regulating mining in the High North. To that end, mining is subject to the domestic legal regulatory regimes of each Arctic state. What are the risks of mining in the Arctic? The challenges connected to mining activities in the Arctic are the sheer remoteness of the environment coupled with the harsh weather conditions, lack of infrastructure, and possible increases in cost as production develops. Environmental impacts of Arctic mining include important changes to the landscape and air, as well as water pollution. There are also various socioeconomic consequences related to mining, mostly due to the impact of settlement on local communities. For example, it has been widely publicized that mining towns are almost exclusively settled by miners, who often develop purely utilitarian relationships with their surrounding area. Their presence may contrast sharply with local and indigenous traditions. Taken together, it is clear that the impact of mining on the environment and local communities in the Arctic should not be underestimated. Lloyd’s, 2012. Arctic opening: opportunity and risk in the High North, Arctic Risk Report. Ondotimi Songi, LL.B., 2010. Current Legal Regime Governing the Arctic Region and Investment by Oil and Gas Companies. International Energy Law and Policy Research Paper Series, n° 8. Centre for Energy, Petroleum & Mineral Law & Policy, University of Dundee; Nowlan, L., 2001. Arctic Legal Regime for Environmental Protection. IUCN Environmental Policy and Law Paper, n° 44.